There is a common concept that the Lord Jesus Christ came to this earth to set up or establish his kingdom, but being rejected by the Jews, he postponed his kingdom and set up the church instead. Proponents of this doctrine believe that Jesus will set up his kingdom on earth when he returns the second time. This concept relegates the church to the role of a stop-gap measure, a kind of after-thought conceived by Christ to provide something to fill the gap between his return to the Father and his return to the earth. It is also commonly believed that the prophets said nothing about the church. They saw only the first coming of the Christ and his yet to come, earthly kingdom. In this lesson, our aim will be to show that the New Testament church was planned by God and prophesied by the prophets and that these prophecies were fulfilled on the first Pentecost following the resurrection of Jesus Christ. Was the church predicted by the prophets? In order to arrive at the correct answer, it is imperative that we understand, that in the Bible, the kingdom and the house of the Lord in the prophecy of the Old Testament often refer to the church of the New Testament. Jesus predicted that he would build his church (Matthew 16:18). He called his church "the kingdom" (Matt. 16:19). Therefore, the church and the kingdom in this sense, are the same. 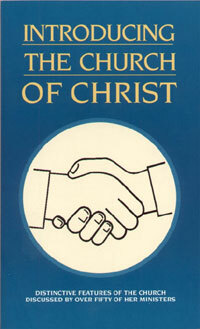 Christ is the head of both the church and the kingdom. The terms of admission are the same. Those in the church are also in the kingdom. The apostle Paul said, that "the house of God is the church of the living God" (1 Timothy 3:15). From these Scriptures, we may conclude that the Lord's house, the kingdom and the church often refer to one and the same thing. At this juncture, I suggest that you read and consider the seventh chapter of Second Samuel. This chapter reveals that David the king, had purposed to build a house for God. In contrast, God rejected David's proposal but promised to build a house for David and the people. This mission would be accomplished through David's seed after the death of the former. In addition to building his house, his throne would also be established (2 Samuel 7:12-16). The full accomplishment of this prophecy, related to Jesus Christ who is often called David and the Son of David. He was of the seed of David (Acts 13:23). The promise "I will be his Father and he will be my Son," is expressly applied to Christ by the apostle (Hebrews 1:5). The establishing of his house and his throne, and his kingdom for ever (2 Sam. 7:13 & 16), can be applied to no other than Christ and his kingdom. David's earthly house and kingdom long ago came to an end. Only the kingdom of Christ is everlasting. On the day of Pentecost, the apostle Peter said that God had sworn unto David that he would raise up Christ to sit on his throne (Acts 2:30). The announcement of the reign of Christ was given on the day of Pentecost. See Acts chapter two. 1. The prophecy would be fulfilled in The Last Days. 2. All Nations would flow unto it. 3. It would have its Beginning In Jerusalem. After interpreting the dream of Nebuchadnezzar, king of Babylon, Daniel predicted that the God of heaven would set up a kingdom which would never be destroyed. This kingdom would not be left to other people, but would break in pieces and consume all the other kingdoms and would stand for ever (Daniel 2:44). When John the Baptist came preaching in the wilderness of Judea, his message was, "Repent ye: for the kingdom of heaven is at hand" (Matt. 3:1). To be "at hand" meant "to be near," denoting that the kingdom was not in actual existence in the days of John. This prophecy of the kingdom was a prophecy of the church. Others who preached the kingdom as near but yet in the future was Jesus (Matt. 4:17) and his disciples who preached it to the lost sheep of the house of Israel (Matt. 10:5-7). The seventy disciples preached it also (Luke 10:1-9). Each of these Scripture references point to the kingdom to be established in the future. Again, let us recall that Jesus said that he would build his church (according to Matt.16:18), and he called his church "the kingdom" in verse 19. Since the kingdom was predicted, therefore, the church also, was predicted. Jesus gave another prophecy when he said, "Verily, I say unto you, that there be some of them that stand here, which shall not taste of death, till they have seen the kingdom of God come with power" (Mark 9:1). Here we can see that some of the people standing there with Jesus would not die until they had seen the kingdom come with power. Now we ask the question, what is the power predicted to come? After his resurrection, Jesus said to his disciples: "Thus it is written and thus it behooved Christ to suffer, and to rise from the dead the third day: And that repentance and remission of sins should be preached in his name among all nations, beginning at Jerusalem (Luke 24:46-47). In this prediction, the prophecy of all nations and beginning in Jerusalem, spoken of by Isaiah, is about to be fulfilled. Now we must check to see if it occurred during the last days. Shortly, before Jesus ascended back to heaven, the disciples asked him if he would restore again the kingdom to Israel. (Acts 1:6). Jesus said unto them, "It is not for you to know the times or the seasons, which the Father hath put in his own power. But ye shall receive power, after that the Holy Ghost is come upon you" (Acts 1:7-8). The Lord made it known that power would come with the Holy Ghost. When we establish the time of the coming of the Holy Ghost, we will know when the power came and also, when the kingdom, which is the church, had its beginning. On the day of Pentecost, the Holy Spirit came and filled the apostles. They spoke with new tongues or languages as the Spirit gave them utterance (Acts 2:1-4). They were charged with being drunk or filled with new wine (Acts 2:13). Peter denied the charge and stated that what the people were seeing and hearing was that which was spoken by the prophet Joel, "And it shall come to pass in the last days, saith God, I will pour out my Spirit upon all flesh..." (Acts 2:16-17). Here we may learn that the events of Pentecost transpired during the last days. The three fundamental facts of Isaiah's prophecy were fulfilled on Pentecost. They took place in the last days; all nations were assembled there; and these events had their beginning in Jerusalem. You will remember that Jesus said that the kingdom would come with power. The power came with the Holy Spirit. Since the Holy Spirit came on Pentecost, we conclude that the kingdom, the church, came on Pentecost as was prophesied. On Pentecost, the people heard and obeyed the gospel. The Lord added to the church those who were being saved (Acts 2:47). No one was added to the church before Pentecost. Therefore, the church had its beginning on the day of Pentecost. The church was also according to the plan or purpose of God. This purpose was a mystery or secret. Paul said that he was less than the least of all saints but God called him to preach to the Gentiles, and to explain to all people the meaning of the secret. God kept this secret to himself from the beginning of the world. What was his reason for this? To show to all the rulers how perfectly wise he is when all his family--Jews and Gentiles alike -- are seen united together in the church, in just the way he had planned through Jesus Christ our Lord (Ephesians 3:7-11). The actual historical formation of the church occurred in Jerusalem on the day of Pentecost. On that day the Spirit was poured out upon the disciples to form the body of Christ, the church. Peter referred to that as the beginning (Acts 11:15-16). The beginning can only refer to Pentecost, thus identifying it as the time of the "baptism with the Holy Ghost." Pentecost marks not only the beginning of the church as the spiritual reality of the body of Christ, but also the visible church. Was the church of the New Testament planned by God and predicted by his prophets? What Scriptures in the Old Testament show the prophecy of the church? What scriptures in the New Testament show the fulfillment of the prophecies?